No matter what I post my most read posts are always the ones in the oat series. 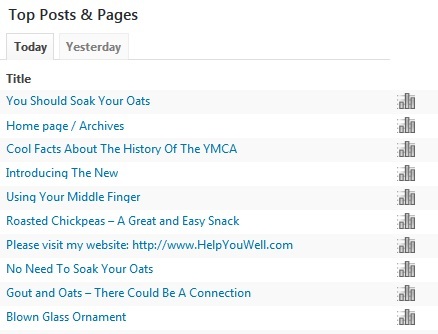 Sometimes the blood pressure one, Blood Pressure Monitors – It’s All In the Wrist, beats them out, but usually my WordPress stats say that You Should Soak Your Oats or No Need To Soak Your Oats have the most views. This is so puzzling to me that I actually did a search to see if “soaking oats” was something slang, a sexual term, or a sexual act or maneuver. I don’t understand how it is – pretty much consistently – the most read post. It is amazing to me. I guess people really want to know if they should soak their oats or not. I don’t actually need to know the answer to the oat soaking question because I don’t eat oats. I know a lot of people eat oatmeal for breakfast because it is supposed to be healthy. But I just don’t like it. It puzzles me and it kinda makes me happy that posts from 2012 are still getting viewed. I am glad that my “research” gets read. I remember when I went to write the post there was so much information . . . so much conflicting information . . . my one post on oats turned into a series of posts. About six posts if you consider the granola recipe. And it is even more amazing because now, as I look at the post, I decided to see if the links still work, and while they do — they go somewhere — not all of them even link up to the information that I had found. Some link up to the pages, but the pages have been changed. So the same information isn’t even still there. I am wondering if people even click the links (which now have been changed or deleted – as of this pose – because they are no longer even connecting to the information disclosed). It seems that a few of the pagse have turned from online information to links to pages where you can buy the books that have the information. Hmm. Yeah, the changes in the internet. So now, I have updated it, I wonder if it will get less views. Now I have to go through the other ones to see what links are no longer linking to the information. I don’t have time right now . . . but I will get to it eventually. Funny, I started this post with an entirely different intent and now I am having to re-do some posts. Let me ask a question that somewhat rounds us back to the start: What is your most read post? I often think that blood pressure taken at the doctor’s office is higher just due to the stress of being at the doctor’s office. Even if you don’t have what they call “white coat syndrome” sometimes the stress of getting to the doctor’s office (maybe there is traffic, or you have had to interrupt your busy life to take time to go to the doctor), the stress of WHY you are at the doctor’s (most of us don’t go to the doctor when we are healthy and feeling fine, so the fact that we are there could be stressful), or the stress of having to wait (often times we don’t get called in by our appointment time, or we do and we are stuck sitting on the table) can be causes for higher blood pressure readings than normal. I think that a blood pressure reading at home is more accurate because you are IN your life. You are IN your normal stresses. That is why I was wondering about the wrist cuffs because I think the situation (home monitor) is more ideal then doctor office monitoring. But with mine showing lower than I would expect I was wondering. It isn’t actually LOW, it is just lower than I expect. Because what I usually do is think, “Oh, I should check my blood pressure.” as I am downstairs so I run upstairs and try to sit and wait before taking it, but I end up pressing the button and just seems lower than I would guess because I was just moving around. Just like with all information I found conflicting information. I found information stating that wrist monitors were good and I found information stating they were not accurate. The main concern regarding accuracy was arm position. The common statement was that the readings accuracy is affected by the arm position so if the arm was not properly placed the reading could be wrong. Makes sense, but I was not truly understand why resting one’s left elbow on a table so that the right and monitor were at heart height would be such a challenge to people using a wrist monitor. I also found information stating that wrist monitors were more expensive than arm cuffs, but then the monitors that I saw being advertised on the internet were less than the cuff ones. So, again, a lot of conflicting information. I did see information stating that wrist monitor quality (meaning reading accuracy) had improved a lot I personally think that cuff blood pressure monitor, the kind where you put your arm in the cuff and secure it around your upper arm, is more accurate. However, I also believe they are more expensive, so I bought a wrist monitor. If you are interesting in having a blood pressure monitor at home, I suggest you buy one from a place that allows you to return it. Then when you go to the doctor take your monitor and take your blood pressure with it to compare to the doctor’s blood pressure monitor. If it is not accurate then you can return it to where you bought it. There is a technique for ensure your arm is in the correct position when using a wrist monitor that could be easier than the elbow-table method. Cross you arm over your heart, as if you are holding your right shoulder in your left hand. This ensures no movement and that the monitor is above the heart/level with the heart. Don’t hold your shoulder just let your fingers rest on the front of your shoulder. I thought this was an excellent method. Are you thinking about owning a blood pressure monitor? Wrist or arm cuff? Do you already have a blood pressure monitor at home? Wrist or arm cuff? Do you get a little “white coat syndrome” at the doctor’s office?